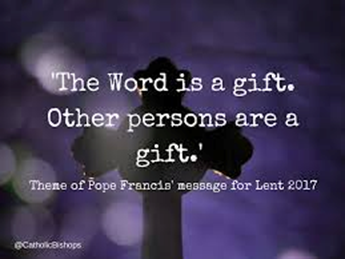 In trying to focus on my Lenten Journey this year I read Pope Francis’ article on what he is encouraging for Christians this Lent. Lent is a season for us to slow down and deepen our spiritual life through fasting, prayer and almsgiving. Many of us are use to making Lenten sacrifices i.e. giving up something, not watching television, not eating between meals, the list goes on. As I was reflecting on this upcoming Lent I realized how Franciscans this journey could be in light of the work and witness of St. Francis. His love for God in the “word” and his witness to “people” through his kindness and outreach. I offer this suggestion if you would like to join me this Lenten season on deepening your Lenten Journey. First through the gift of the “word of God”, inviting us to listen and ponder deeper. There are many simple resources for the scriptures from daily readings booklets, to websites, to apps you can have on your phone or participate in a scripture study. And secondly recognizing the value in “other persons as gift” in forming and building right relationships with people. Monsignor Keith Derouen from the Diocese of Lafayette shared a list of 19 things in the local newspaper, one might consider this Lent and beyond. Here are a few related to the theme of “persons are gift” that I’d like to work on and might be helpful suggestions. Envy: I am blessed. My value is not found in my possessions, but in my relationship with my Heavenly Father. Impatience:God’s timing is the perfect timing. Sense of entitlement:The world does not owe me anything. God does not owe me anything. I live in humility and grace. Bitterness and Resentment:The only person I am hurting by holding onto these is myself. Blame: I am not going to pass the buck. I will take responsibility for my actions. Gossip and Negativity: I will put the best construction on everything when it comes to other people. I will also minimize my contact with people who are negative and toxic and bring other people down. Pride: Blessed are the humble. Worry:God is in control and worrying will not help. The need to please everyone:I can’t please everyone anyway. There is only one I need to strive to please. Excuses: A wise man once said, if you need an excuse, any excuse will do. Whom did I help to encourage? However, such a journey should never be “spiritualized” in the distorted sense of being disconnected or out of touch with the world around us. Life in our fraternities and ministries demands that we pay attention to the social and political issues that touch the common good.